Even the most ardent car lovers would struggle to identify some of the vehicles built by major multinational auto companies in China. A BMW Brilliance Zinoro, an SGMW Baojun and a Dongfeng Nissan Venucia are among the “indigenous” brands that the Chinese government requires foreign-invested joint ventures to develop in return for approvals to expand production capacity in the world’s largest auto market. SGMW – GM’s joint venture with SAIC Motor and Liuzhou Wuling Motors – embraced the dictat by developing popular Baojun sedans and mini-cars. SGMW sold more than 100,000 Baojuns in 2013, up almost 20 per cent. Priced at just Rmb50,000 ($8,000) to Rmb70,000, Baojun’s success has come primarily at the expense of China’s struggling domestic automakers, suggesting that the policy has had at least one unintended consequence. March sales of Chinese brand sedans fell 12 per cent year-on-year, as local automakers lost their market lead in the segment to their German rivals led by VW. “The indigenous brand policy is really dumb because all it does is cannibalise the local Chinese brands,” said Janet Lewis, head of Macquarie Securities industrials research team in Hong Kong. The damage that Baojun and other joint ventures’ indigenous brands, such as Nissan and Dongfeng Motors’ Venucia, are inflicting on Chinese car companies could explain why the government does not appear to be putting much pressure on multinationals who have only done the bare minimum. 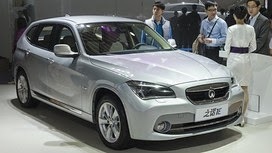 BMW’s joint venture with Brilliance Auto “rebadged” the German company’s X1 and electrified it for China’s anaemic new energy vehicle market – thus avoiding confusion with its better selling conventional cars – while Ford has yet to reveal its local contribution to the market. The Chinese government’s indigenous brand requirement is particularly challenging for Ford as it runs counter to outgoing chief executive Alan Mulally’s “one Ford” strategy, under which the company jettisoned brands such as Jaguar Land Rover and Volvo Cars to focus on a narrower portfolio. John Lawler, the head of Ford’s China operations, insisted that the US automaker is in compliance with Chinese government policy mandates, even though it still has not rolled out an indigenous brand. “We’re satisfying all the requirements from the government but at this point there really isn’t anything for us to announce relative to an indigenous brand or anything along those lines,” said Mr Lawler. Aside from a few Communist Youth League banners and a summary of the reforms unveiled at the Chinese Communist party’s third plenum last November, there is little to distinguish Dongfeng’s wholly-owned Aeolus car plant from its nearby joint venture with Peugeot Citroën and Honda. Situated in a development zone in Wuhan, an industrial city in central China, the Aeolus factory has borrowed equipment and manufacturing systems from both Peugeot and Nissan, state-owned Dongfeng’s third joint venture partner. The parking lots outside each plant, however, tell a different story. While thousands of cars are lined up outside Dongfeng’s Peugeot and Honda factories in Wuhan, awaiting shipment to distributors across the world’s largest car market, its Aeolus factory produces only about 300 vehicles a day, or about 100,000 units annually. Dongfeng, one of China’s “Big Three” car groups alongside Shanghai Auto and First Auto Works, has more joint ventures with international car groups than any of its domestic peers. Including Korean partner Hyundai, it currently operates four joint ventures and signed a fifth partnership agreement in December with Renault. The Wuhan-based company is also poised to take a 14 per cent stake in Peugeot as part of €3bn capital raising. Last month, the China Association of Automobile Manufacturers announced that the country’s car sales grew more than 15 per cent last year to 18m units – almost triple the number sold in 2008. During this period, the market share of Chinese brands peaked at 31 per cent in 2010 and has since fallen to 27 per cent. Meanwhile, China’s 2013 car exports fell almost 10 per cent year on year to just 596,300 units – accounting for only 3.3 per cent of total production. Imports, meanwhile, nearly tripled to 1.1m vehicles, driven by strong demand for luxury vehicles. While China exports more cars to Algeria than any other country – with its next biggest markets being Russia, Chile and Iran – the largest source of its own automotive imports is Germany. “The quality of Chinese cars currently can’t compete with multinationals,” says Yao Jie, deputy secretary-general of the association. “We need to work harder to improve domestic brands.” According to CAAM, last year China’s 10 most popular models, led by the Ford Focus, were all manufactured by Sino-foreign joint ventures. The challenge for China’s car companies will be to achieve this in the world’s most competitive automotive industry. When Japanese and Korean carmakers broke out in the 1970s and 1980s, they did so from the shelter of protected home markets. Dongfeng’s pending deal with Peugeot and Geely’s acquisition of Sweden’s Volvo in 2010 suggest another way forward. What Chinese car companies lack in experience and technical expertise, they can make up for in cash. Following a decade of rapid growth that culminated in a stimulus-driven surge in demand in 2009-2010, the China auto market sharply decelerated, with growth slipping to 2.5% in 2011 and 4.3% in 2012. This brief slowdown was followed by 14% growth in 2013, with overall sales exceeding 22 million units. While the market growth has been spectacular, there are rising concerns on the sustainability of this performance as the market may be approaching a saturation point in the traditionally strong coastal regions. Intense competition among automakers as they pursue emerging growth opportunities in specific regions and segments is anticipated. The aim of this session is to discuss opportunities and challenges faced by different competitors as they deal with this a transitional period in the world’s largest automotive market. Mr. Uwe Stadtler, CEO of BMW Automotive Finance (China) Co., Ltd.